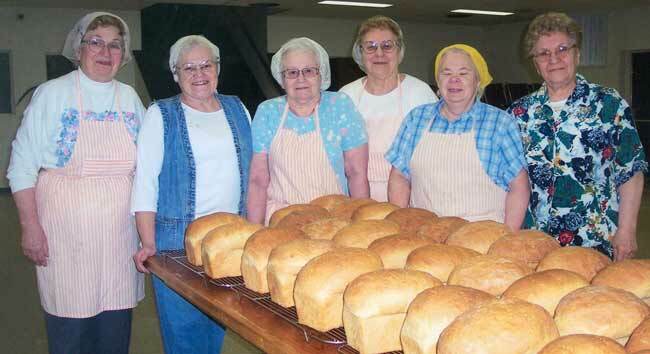 The Grand Forks USCC Bread Committee is now celebrating 20 years of baking and still going strong! We want to thank all the people who donated money 20 years ago towards the purchase of the Hobart Bread Mixing Machine, and all those who've helped in any way over the years, as well all of our loyal bread customers. God Bless you all with Health and Happiness! (l. to r.): Helen Horkoff, Liz Zwick, Patsy Horkoff, Mary Horkoff, Florence Kalmakoff, Dorothy Popoff. When our Grand Forks USCC Community Centre was built around 1980 and the community kitchen was all set up in the basement, many banquets, weddings, funeral meals and other events were hosted, all served and catered by our ladies. The homemade bread served at all the meals was at that time brought from home and donated by the ladies who were asked by the Committee to do so. As time went on, due to more ladies having jobs and tighter schedules, some ladies began to bring store-bought bread when they were asked for a bread donation. In order to maintain our traditional Doukhobor way of hosting, our ladies in charge started mixing bread by hand and baking it in the USCC kitchen, using flour from our own Grand Forks "Pride of the Valley" flour mill: white, whole wheat, and rye, also mixing dough for tarts, and lapsha, all by hand and in huge amounts. In 1994, while Helen Horkoff and Dorothy Popoff were serving a term on the USCC Ladies Organization Committee, they were also working in a local restaurant for several years making Russian foods like borshch, bread, tarts, buns, etc. There they mixed the bread and tarts on a big electric floor model Hobart Mixing Machine, so the thought came to them - why not get a machine like that for our USCC Centre kitchen? It would be an energy saver for the ladies and they could make bread, tarts, lapsha, etc. faster and easier. As the Chairlady of her cooking group for that year, Dorothy decided to discuss this idea with our USCC Honourary Chairman, the late John J. Verigin Sr., asking for his opinion and maybe his approval. He blessed the idea, and agreed that it would ease the labour for the cooking ladies, but said it would be very costly and our USCC budget might not be able to cover the cost. Dorothy assured him that the ladies planned to raise the money to cover the cost but were first seeking Mr. Verigin's approval and blessing. His answer was a warm, "God Bless you ladies with success in this useful venture -- V dobriy vam chas!" The next step was to present the idea at the USCC Ladies Organization's Annual General Meeting. At first, a few ladies were reluctant to buy the machine, but after much discussion, it was agreed to go ahead with the much-needed purchase. Shortly afterward, Dorothy inquired as to the details and address for the machine from Alex Jmaeff in Creston, who had experience in owning a bakery there. In order to be able to organize the fundraising and purchase of the mixing machine, the ladies formed a Bread Committee consisting of: Dorothy Popoff – Chair, Liz Zwick – Secretary, Helen Horkoff, Mary Horkoff, and Mary (Arishenkoff) Popoff (now deceased). We will never forget the excitement of the Bread Mixer delivery! We decided to put it next to the large fridge in our Community Centre kitchen. Wallace Dergousoff – God Bless Him – did the placing, doing all the electrical adjustments, setting it up by the level, etc. What a day and "Gospodi blagoslavi!" Now we could mix dough with electric power and not the power in our arms! The flour from our flour mill: white, whole wheat and rye, and also additional Keynote unbleached white, was all stored in the basement. We called customers-to-be and realized we needed a deepfreeze for bread not immediately bought. Walter and Nina Hoodikoff heard about this and said they would loan their late parents' deepfreeze, and soon it was delivered into the basement. What a blessing - thank you kindly! After a lot of years of carrying flour up and down the basement stairs, Wallace Dergousoff found an enclosed space under the Centre's dining-room stairs for a storage area to keep all of our supplies on the same level as the kitchen. Wallace, together with Pete Chernoff, John Koftinoff and Fred Horkoff, cut through a door and constructed a storage room. By then, we had bought a small deepfreeze for butter, etc. Pete Chernoff then built three shelves on the wall, and also built a handy wide bench that was fitted in between the wall and small deepfreeze, and painted the shelves and bench. Thank you and God bless you all! A larger deepfreeze was also purchased and Hoodikoffs' was returned. The new freezer was placed in the adjoining room in the basement. We make rye, whole wheat, and white bread once a month and store some in the small deep freeze to ensure enough bread for two funeral meals. On our bread-baking days, the doors of the USCC Community Centre have to be opened for us at 6:00 o'clock in the morning. Walter Hoodikoff, Steve Babakaiff, Lucille Faminoff and Sam Semenoff have all helped out with this over the years. Wallace Dergousoff and Walter Hoodikoff have faithfully delivered flour from the flourmill over the years. Thank you and God bless you all! Several years ago, Fred Bojey approached us for information about our bread making machine. We gladly passed it on. While he was with us, he noticed our bread pans were a collection from home and from friends because we needed about 70 to 80 pans. He said: "Let's order good ones, made to measure, that need no oiling and are stain free. If we order 500 they will be cheaper. Give me the amount you want of them, and we'll buy some for Brilliant too. The rest of them I'll sell to the stores for their stock!" The pans he ordered are fantastic! Recently, Fred directed us where to get flour, when the local stores did not have 50 lb. sacks. We want to give a big thanks to Fred Bojey, for his help and ideas. Over these past 20 years, besides supplying bread for our traditional Doukhobor funerals and selling to our loyal customers, the Bread Committee has donated bread to community fundraising events, like borshch luncheons, peace projects, grad dinners, etc. Donating bread - so symbolic of peace in our culture, of caring and sharing, of feeding the hungry - seemed to give our Committee members a feeling of peace within our souls. And as a Committee, we have always worked in peace and harmony, and enjoyed our get-togethers on our bread-baking days with our delicious pot-luck lunches - which have resulted in much recipe sharing. Before starting each bread-baking session, we have always recited "Otche Nash" - the Lord's Prayer. Proceeds from bread sales have been donated to various groups and activities in need of such help. In addition to paying our share to the USCC Community Centre expenses, for each use of the kitchen, over the years substantial annual donations have been made to the Verigin Memorial Fund, ISKRA, the USCC Website and other aspects of our organization's function, as well as to other charitable purposes in the community. The 20 year success of the Grand Forks USCC Bread Committee was made possible by cooperation and togetherness, sharing, caring, support and unison of people. Without wishing to omit anyone, we are acknowledging everyone for their commitment to this tradition, from our husbands and families for their help and support, to the USCC Office Staff for assisting with bread sales. A special thanks to the Verigin family for their support and blessings over the years. God Bless everyone, and may this tradition continue! Liz Zwick, Dorothy Popoff, Helen Horkoff.